Furious 7 used Paul Walker Body Double and CGI to finish his uncompleted shots. Check out how Furious 7 used CGI to give the perfect cinematic sand-off to the movie character of Brian O’Connor by Peter Jackson’s WETA Digital Studio. Paul Walker passed away in tragic car accident during the midway of production Furious 7 (Fast and Furious 7) in November 2013 . But, “The show must go on!”. So, the Director, James Wan, had to used the CGI approach to make Paul Walker digital double with extensive light matching, 3D tracking and camera matchmoving to finish the uncompleted shots. He got Walker brothers to finish the movie through Brian O’Connor CGI. One of the best Post Production houses, Peter Jackson’s WETA Digital had accomplished this mammoth work. They already had set their benchmark with Caesar (Dawn of the Planet of the Apes) and Gollum (The Lord of the Rings Trilogy). The VFX studio also used unused shooting plates of Fast and Furious previous franchise to finish this installment. 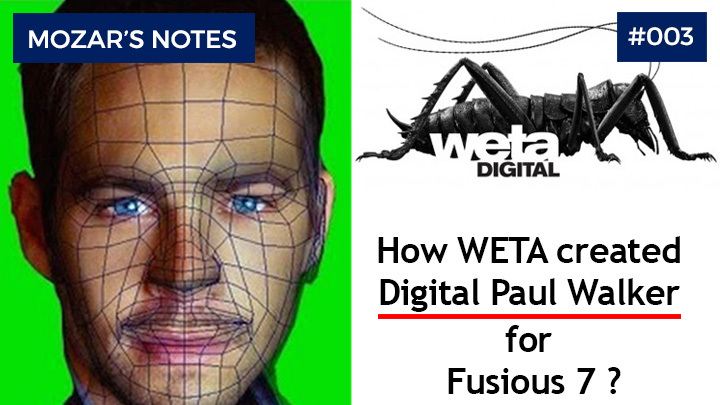 More than Paul Walker Digital Double or CGI, Weta tried very hard to use him as much as possible. Digital Paul Walker is great tribute to real Paul Walker on silver screen. Check out VFX before and after image below. A huge respect and kudos to the entire Animation and VFX team of WETA Digital to give perfect cinematic sand-off to Paul Walker and his movie character Brian O’Connor. For live action shooting, four actors with similar height body of Paul Walker were used. They were used to capture primary shooting data. Paul’s brothers – Cody Walker and Caleb Walker – were used for close up shots. The movements Paul Walker body double were used as base layer. Paul Walker CGI face was matchmoved with proper lighting condition on these footage. To make seamless output, various CG render passes were composited with live action shooting plates and chroma footages. Additional warps and effects were used to get the depth and volume of his entire body. Check out the huge tribute to Paul Walker by his fans and celebrities. One of the most viral tweet image. Cody Walker and Caleb Walker were used as body doubles to finish the movie.